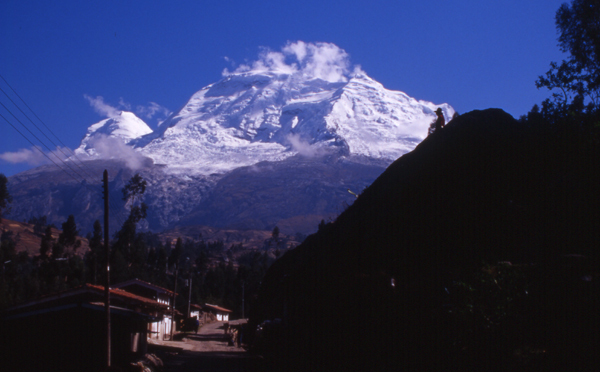 The higher of the two Huascaran peaks and the highest summit in Peru and also anywhere in the world in the tropics. The south side of Huascaran Sur from Shilla. The two peaks of Huascaran seen from above Yungay. We can organise guided climbs of Huascaran. For details of how to climb the two Huascaran peaks and many of the other the neighbouring peaks of the Cordillera Blanca in Peru, please see our guidebooks, which are available in English, Spanish, Polish and French editions, direct from us or from all good bookshops and mountaineering shops.